DEV Systemtechnik has added a new cost-efficient system to its RF-over-Fibre (RFoF) product range. The new product line called DEV Alpha ideally serves operators of cable networks and satellite ground stations. RF signals transmitted over conventional coax suffer signal quality loss, especially over increasing distance. Thanks to RFoF technology, this can be almost completely avoided. Here, electrical signals are converted into the optical domain for fiber transmission. At the destination, optical signals are then converted back into electrical form. As part of the current RFoF product line Optribution, DEV Alpha serves clients seeking very cost-effective fiber optic connections within tight rack spacing. 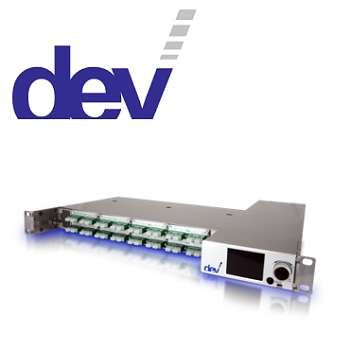 DEV consolidates an unprecedented 32 connections into one rack unit (RU). Owing to its splitters and switching modules, Alpha is also suitable for redundancy applications. DEV Alpha will be featured for the first time at the IBC 2018 event in Amsterdam from September 14 to 18.